Picking up from the last issue, Max Lord's Squad busts into Belle Reve, only to be confronted by both the Justice League and Suicide Squad. Superman tries to convince Lobo and the rest that Max is manipulating them, but Max control over them is too strong, and a battle ensues between the three teams. During the battle, Johnny Sorrow opens a portal from within himself, and brings forth dozens of monster, as they even up the playing field for Max team. Meanwhile Max has slipped away unnoticed, heading toward the "secret weapon" he is after. He comes to head with Killer Frost, with a little "persuasion" from Max, he ends up using her as he does the others. The Squad and League having defeated Max Squad and with the disappearance of the monsters are now free to stop him. When they reach him, they realize it's too late, As Max has now gained possession of the Eclipso gem, and takes over control of the League, leaving the Squad to be the only opposition. 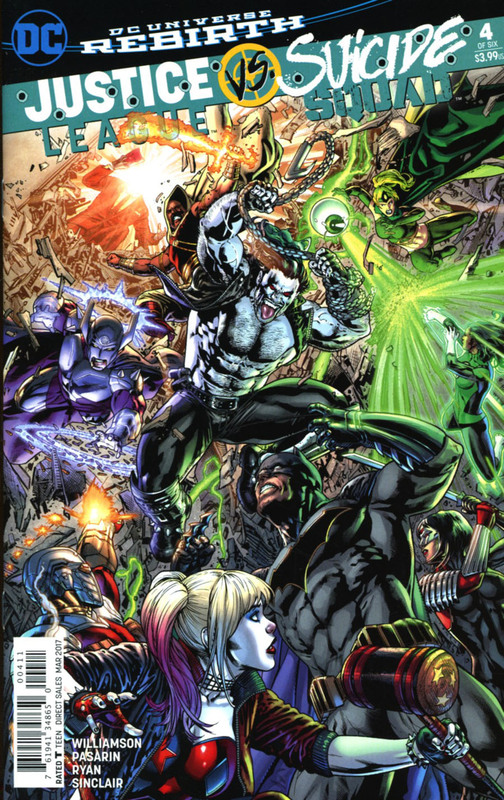 Story - 4: This issue was pretty much the mandatory showdown between the first Squad, and the JL/SS. Was it predictable? Of course... Was it terrible? No! As I stated in previous reviews for this crossover, it is very generic in its formula however, it was still an enjoyable read. And if it's enjoyable, therefore, it's done its job. This book/event/crossover is not meant to be an "Oscar" contender, or win any sort of prestigious literary award. It's meant to be an event that will spin off a couple of different new series, and be something extra that we can enjoy reading along with our regular books. Think back to crossovers like Legends, Final Night, Underworld Unleashed, Day of Judgement, and Armageddon 2001. They were all just summer/winter events held almost annually to boost some sales of course, but also give us the readers something awesome to read, discuss with friends and now, look back with fond memories and remember how awesome we thought they were back then. This book is the same. Years from now, young readers will look back at this and think what an awesome time they had reading and collecting this series. Who knows, they may even podcast about it... Or whatever takes the place of podcasts. So my point is let's just take it for what it is, and try and look at the positives rather than focusing on any and all of the negatives. Because if you don't have fun reading these books... then why waste your money, and maybe you should find something else that brings you some joy. With all that said, I enjoyed this issue. It was high octane action, with subtle story developments that have managed to still keep me hooked. As I've stated in earlier reviews, the promo's for this crossover ruined a lot of surprises. So we knew that Max Lord was going to have a team of his own, we know that certain characters from the Squad will switch sides and we knew that ultimately Eclipso was going to show up. For the sake of the reviews, I tried to keep the mystery going, but seeing as how we are at the tail end of it all, it's ok to mention such things now I feel. Before we get to Eclipso though, I want to touch on some other aspects, the first being Lobo. In the past, I had been a fan of Lobo. I felt he was DC's answer to both Venom and Wolverine for most of the 90s. I always thought he was a cool character, and loved when he turned up and caused a little trouble for our boy Big Blue. Now, in this post New 52/Rebirth universe, I feel the changes creative have made on Lobo have left him a little... Xeroxed! Let me elaborate. Before, Lobo was a take no prisoners, alien bounty hunter that could go toe to toe with Superman. Now he's more like a hired mercenary whose powers and abilities are more Wolverine than Keith Giffen's original "Baddest Bastich in the Universe". So when Lobo got his head blown off by Batman, it left me a little... Underwhelmed! Obviously Lobo is depowered now, but I'd have imagined he'd still be quite bulletproof, meaning that Batman injecting the Nuero-Bomb into him should have been harder than what it was. Ironically though, I didn't mind his head being blown off... As we know, it will grow back. This time, his mind will most likely be free of Max control... And maybe like Solomon Grundy, another more passive personality may emerge. I'll quickly touch on the awesome "King of Tears" Johnny Sorrow monster moment. I didn't expect that, what's more, I like the way Wonder Woman was able to defeat him using his reflection in her bracelets. Harley is obviously crazier than we thought. I guess the Joker would be immune to Johnny Sorrow also. I also really like the fight between Katana and Rustam. Rustam's flaming blade is unable to defeat Katana's Soul Blade. It was a nice little sword between the chaos. It reminded me of the end battle scene from the first Pirates of the Caribbean movie. Now... Eclipso... He has never really been a favorite character of mine, but when used well, he can be interesting. I hope that Williamson has a few tricks up his sleeve. What I did like most though, was that he deemed the Squad "losers," and didn't bother to possess them. So clichéd as it sounds, the so called "losers" will have to overcome great odds to win the day. Again, I hope that Williamson is able to do this in a compelling way. I have read many complaints about how unevenly matched the Squad was to the League, so I hope that some clever writing win over some of the more critical fans. Really interested to see what Max will be able to do with the Eclipso gem, coupled with his own powers. Art - 5: So this issue we have Fernando Pasarin on pencils, and boy does he deliver an action packed story. Pasarin has been at DC for a good while now. The last time I remember seeing his art was in one of the extended Green Lantern family titles. Pasarin's style reminds me of Bryan Hitch's art a lot. He has the same balance of reality and fantasy in the way he draws. He would be a good fit for a Hitch penned tale, or an Alex Ross project. 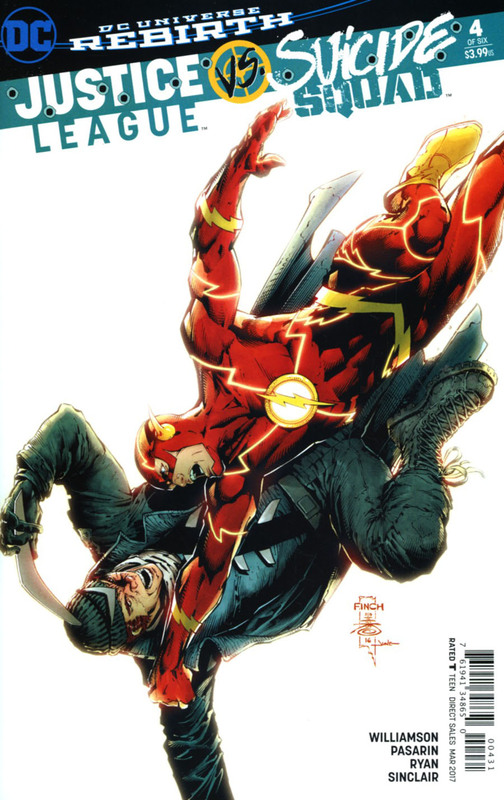 With this issue, mainly being a slugfest between the first Squad and the JL/SS team up, Pasarin manages the subtle moments with action scenes quite easily. Such as the scene where Deadshot and Amanda Waller are running from Lobo, and Batman manages to make the save. This could have been an easy page to botch, but Pasarin's pacing was excellent. It almost felt like a sequence from the original Star Wars trilogy... Dangerous peril, and a last minute save, followed by a quick escape. I love that the splash pages were used sparingly, and when they were used, they served the narrative well. Also Pasarin has a good handle on Cyborg. Something so many artists can't manage to do. In fact Pasarin and Will Conrad are the only two artists this side of Ivan Reis that can make Cyborg look cool and like he belongs! It is unfortunate that so far that issue #3 by Jesus Merino was the weakest drawn issue so far, even though I love his art. Having only two issues to go, I'm curious as to whose art will pop up next. Editorial has managed to deliver top notch art so far, so hoping the trend continues. 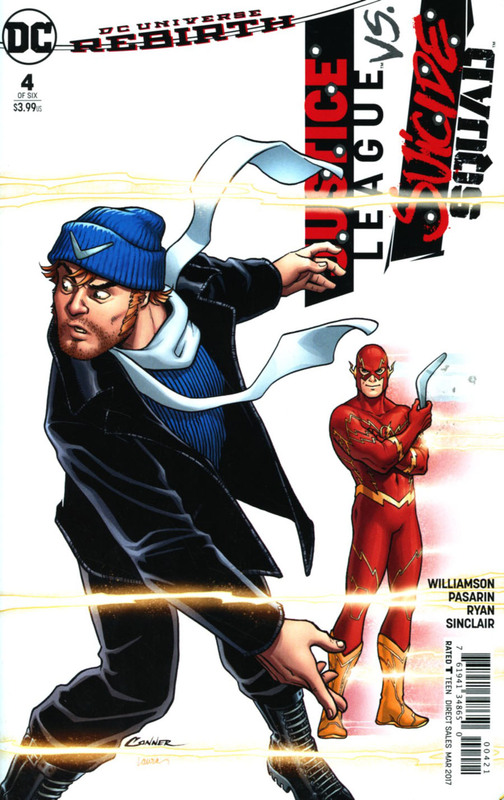 Cover Art - 5: I love this cover, as it depicts exactly what happened this issue. The composition is strong, and just makes you want to open the book and read what's happening! Variant Cover Art - 4: I actually like this one from Conner more than the previous 3. I think it captures the essence of both Flash and Capt. Boomerang. Variant Cover Art - 5: Awesome piece by Finch and Miki. I like Flash and Capt. Boomerang fighting against a white background. Really works for me!